We’ve had another mild, sunny week, I managed a good session in the front garden digging up more weeds, still plenty to go though! 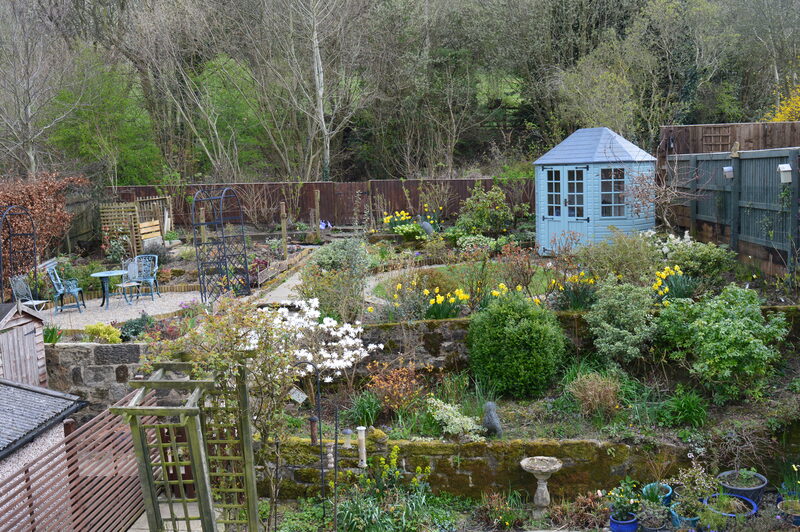 The back garden though is looking pretty respectable at the moment, it’s that time of year when things change almost daily, new shoots appearing, leaves unfurling or flowers opening. After several months of winter it’s a lovely time of year. Last week my magnolia stellata was just coming into flower, it is now glorious, the scent fills the air as you walk past. The mild weather means the flowers are lasting well, bad weather turns them brown as they are so delicate. Round the patio I’ve several pulsatillas (Pasque flower) just starting to flower, I used to have a semi-circle of them until we had some building work done and they all disappeared, last year I planted three or four replacememts. I really like these plants as not only is the flower pretty but the seed heads are big fluffy silver heads which last for ages and look lovely. The daffodils have lasted well this year, they’re still making a colour splash under the roses. The road embankments and verges here in the UK look wonderful at this time of year as they are often covered in daffodils. I think quite a few years ago councils made a concerted effort to plant the bulbs and now after decades of dividing they really cheer us up as we travel around. I have a vague recollection from when I was a young child of seeing the council workmen planting hundreds of bulbs along the roadsides, so we’re talking about 40 plus years ago! There’s all sorts of shoots appearing round the pond, Solomon’s Seal, hostas, dicentra, mint, geranium, in a few weeks time it will look very different. 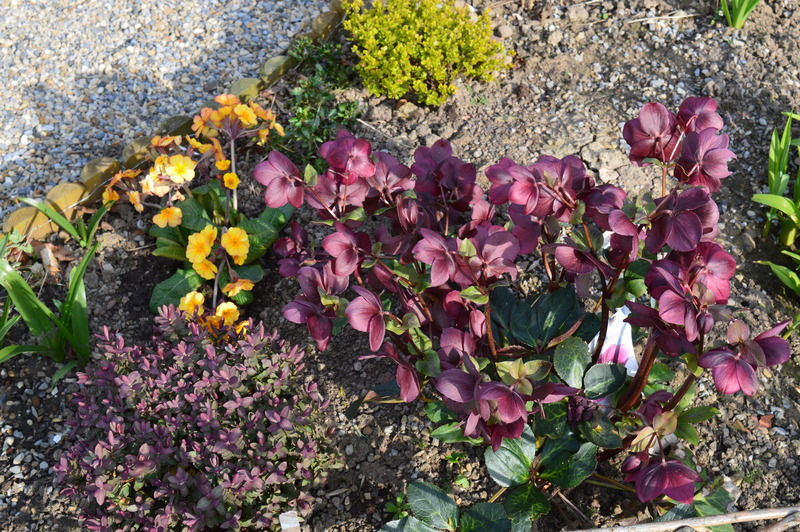 At the moment the hellebores are still putting on a good show. Azaleas are just coming into flower too, they seem to be a bit a head of the rhododendrons. This purple one is in my Amber & Amethyst garden, it’s just a little one. Sometimes plant arrangements work better than I could have hoped for, at the entrance to the Amber & Amethyst (AA) garden I have a purple hebe, my favourite wine hellebore, a berberis and an amber primula I planted last week, the colours work really well together. I just need the hebe and the berberis to grow a bit more! I’m trying to crack on with the front garden at the moment, whilst keeping a close eye on the back so it doesn’t suddenly run away from me! This entry was posted in Garden and tagged Magnolia Stellata, Spring garden. Bookmark the permalink. Lovely garden. 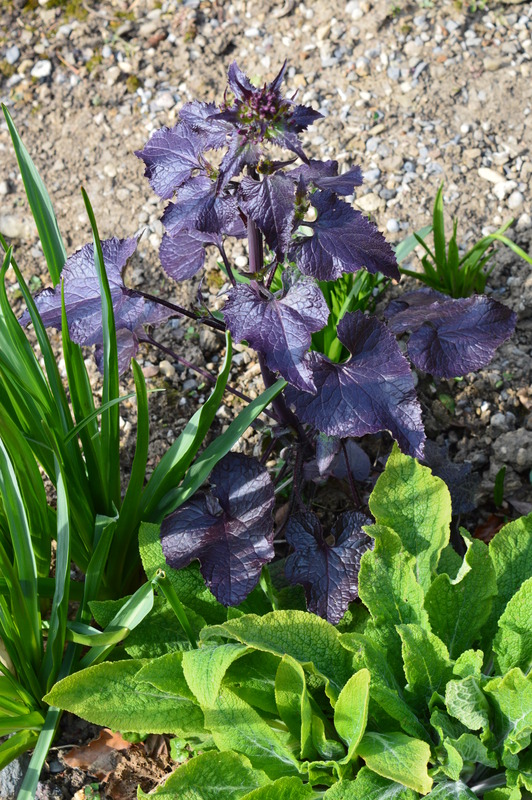 No idea what that dark leaved plant is, but I am going to have a search in my plant book. It looks interesting. Thanks for the nice post. Your magnolia is just magnificent this year! I so enjoy your weekly garden posts, and your garden is looking so lovely this year, your goal of three sessions a week has paid huge dividends! Lovely! Your blossoms are much ahead of us, here in Michigan, USA! We still had snow showers Saturday night. I’ve seen snowbells and crocuses, but that’s about it here. The purple flower looks like purple basil to me, but I am not familiar with your country. Your garden is just Beautiful! That was a lovely meander! I’ve had a plant UFO in the garden before and I usually take the chance and let it grow a while before deciding if weed or something I planted long ago and forgot about! One year I ripped out my dahlias as they came up as I thought they were weeds – yikes! Thanks Tierney, I’m sure I’ve dug out loads of geums as they look just like a common weed- it’s probably the wild version of geum!! Lovely!! Your climate is a bit ahead of us, I am hoping the warmer days are here to stay. Our azaleas are not yet blooming, although some buds have appeared. We had a good daffodil year too.